When the business cycle experiences an upturn, Americans' chance of suffering a large fall in income decrease. But this cyclical pattern has been accompanied by a gradual rise in the overall prevalence of economic insecurity in good times as well as bad. During downturns, economic security has eroded, but between downturns, it has not bounced back to previous levels. The "new normal" in each subsequent economic cycle has featured a higher level of economic insecurity. For example, at any given unemployment rate, more people are experiencing insecurity than in the past. In 1986, the unemployment rate was 7 percent, and the ESI was 14.3 percent. In 2002, the unemployment rate was 5.8 percent, but the ESI rose to 18.8 percent. The most recent recession resulted in record insecurity with an ESI of 20.5 percent in 2009. How we interpret the trends over the past quarter century depends in part on whether the mid-1980s were relatively secure or insecure for Americans. It is possible to trace one dimension of the index—major income loss—back to the late 1960s by using the Panel Study of Income Dynamics (PSID). The more limited index available back to 1968 indicates that the risk of major income loss was almost a third higher in 1985 than it had been in the late 1960s. This suggests that 1985 was simply a way station on the long-term upward rise of insecurity since the late 1960s. Despite economic growth over the past forty years, the share of Americans experiencing large income drops has risen substantially. Because the PSID has been conducted only once every two years since 1996, the only way to look at income loss after 1996 is to compare income in one year to income two years later, rather than from one year to the next. 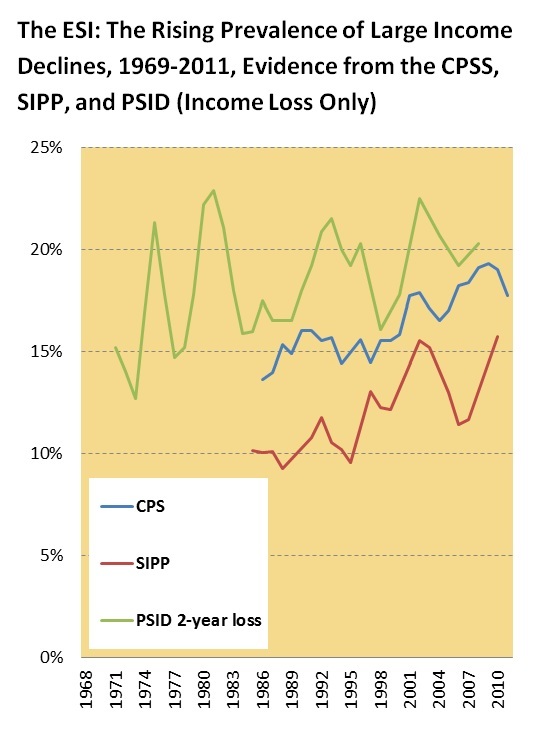 Partly for this reason, the PSID shows a higher proportion of Americans experiencing 25% or greater income drops than does the SIPP, although the trends match relatively well during the overlapping years. 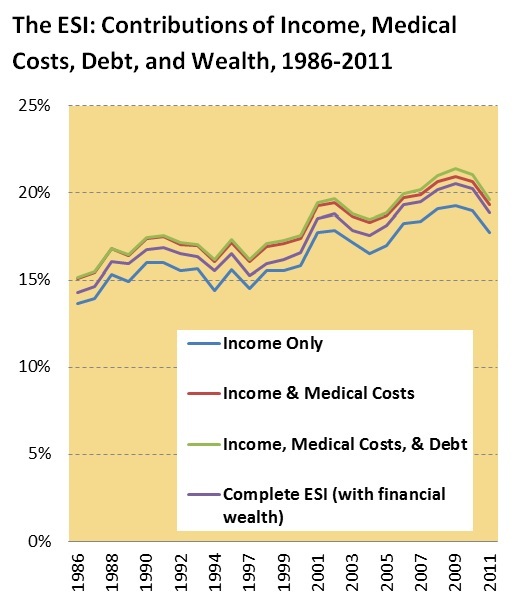 Breaking the ESI down into its component parts shows that the rising chance of income loss, the growth of out-of-pocket medical spending, and rise in household debt all contribute to the upward trend. By contrast, the degree to which the ESI rises over time is reduced by taking into account the liquid financial wealth that some households have to cushion large losses. The largest contribution to both the level of the ESI and the upward trend is the increasing chance of large drops in household income.